This article is about a snow shovel handle extension. The benefit of using one is that you don’t have to bend down as much, making shoveling snow easier on the back. Tall people in particular will appreciate a snow shovel handle extension. 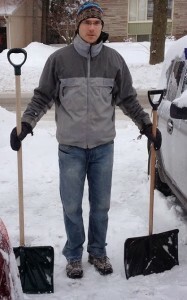 Of course it helps if you have a decent shovel to start with as detailed here: extra long snow shovel for tall people. 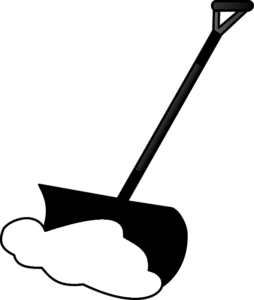 Traditional snow shovels have straight wooden shafts for handles. This, of course, makes them easy to manufacture. But as far as ergonomics, this is not optimal. Specifically, one must bend down when lifting a load of snow. Perhaps this is why shoveling snow is notorious for aggravating back injuries. This will be exacerbated for tall people. 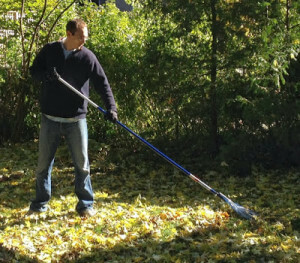 One solution is the curved snow shovel, which brings the midpoint of the snow shovel further from the ground. The difference is only slight though, and these really haven’t taken off. Luckily, there is a better solution out there. A snow shovel handle extension mounts on a standard straight snow shovel handle. It saves the user from having to bend down so much. There are a variety of snow shovel handle extensions out there. 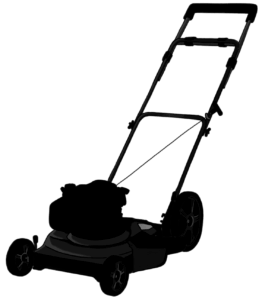 The one reviewed in this article is the Shovelution, which the inventor kindly sent me to try out. What is unique about this snow shovel handle extension is that it is a single band of spring steel rather than a rigid component. I thought at first this would feel flimsy, but this wasn’t the case at all. The inventor suggests the spring is even advantageous for storing kinetic energy. I’m not totally sure if I noticed this. One issue I did notice was that the handle flops around a bit which can make it a tad tricky to grab. But I’m sure you’d get used to this over time. The snow shovel handle extension takes literally a mere minute to set up. Two hose clamps hold it firmly in place. As far as its mounting position on the snow shovel handle, this is typically near the scoop. For me though, being tall, I placed it a bit further up. After just a few minutes of shoveling, I could tell that the snow shovel handle extension would be a huge help for tall people. I didn’t have to bend down nearly as much. And despite this, I was effectively using a wider grip, which means less torque acting on my spine. But I still like my extra long snow shovel for tall people best. Perhaps I will try attaching the snow shovel handle extension to it. That just might be the ultimate solution for tall people. 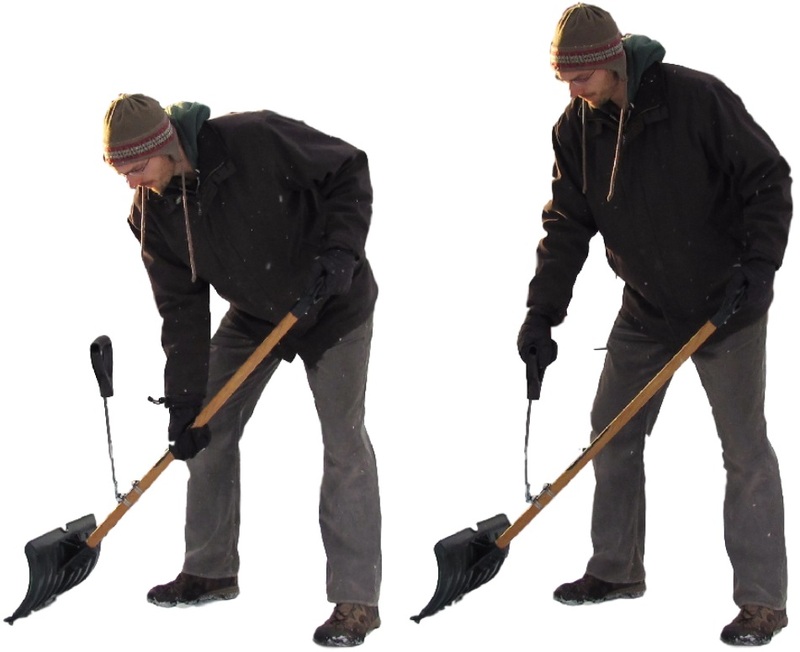 The snow shovel handle extension can also be used for other kinds of shovels too, like garden spades. I’ll have to try that out this summer! Check out Shovelution.com for more details on this snow shovel handle extension. 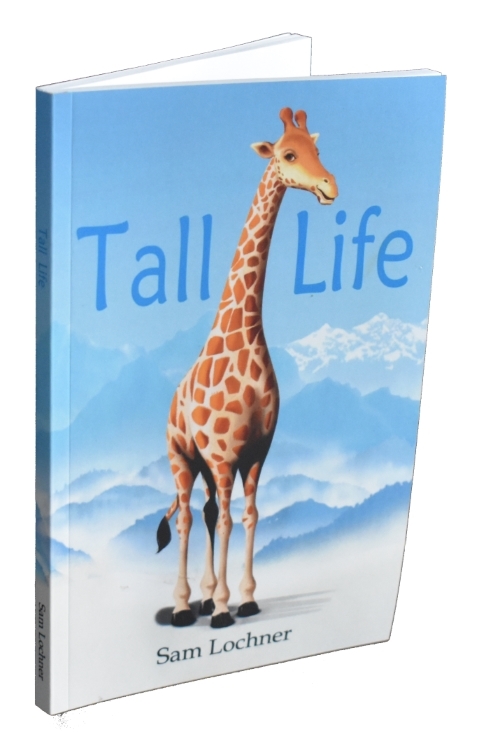 For similar posts, check out tools for tall people. Has anyone ever tried one of these(shovel extension) on a wagon? Not that I know of, interesting idea though! A wagon extension is exactly what I’m looking for! Please make one!!!! I plan to, probly not till next summer though! Be very careful using this type of snow shovel extension. I am just getting over 7 weeks of physio and exercises to reduce neck pain caused by this extension. It puts increased stress on neck and shoulders! I’m tossing mine out!